This Torah portion makes reference to three things which are, quite possibly, more ancient than the Torah itself. These are: a Sumerian cult, a quotation from a lost Hebrew book and a fragment of a folk song. There is a recurrent motif in the book of Numbers. The people complain about their seemingly interminable journey through the wilderness and the limited menu of manna, yearning for the remembered comforts of Egypt. We saw that most of the spies sent ahead to Canaan returned with pessimistic and defeatist reports of an unconquerable land. We saw how Korach and other Levites rebelled against Moses and were punished. 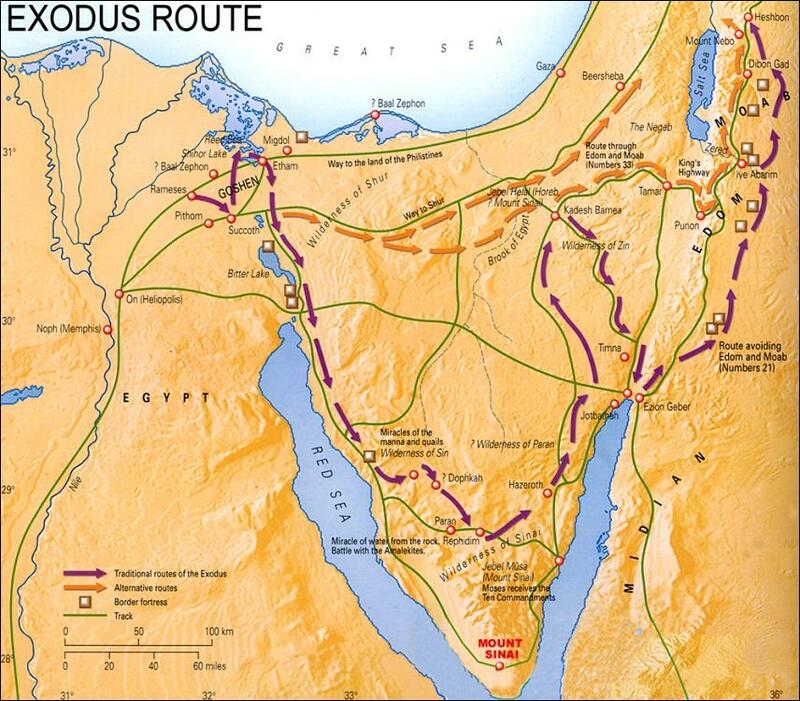 Rashi explains that the Israelites were discouraged because of the many years travelling and indeed, Google Maps shows that the distance from the Red Sea to Jericho is thirty-eight miles, doable on foot within a week, in peace time. But there was no peace for the Israelites on their journey through the wilderness. Today’s Torah reading begins by describing an attack from the Canaanite king of Arad, which ended badly for him, with a herem, the destruction of his towns. Protest, complaints and rebellion within the Israelite camp did not go unpunished, and, as midrash points out, on this particular occasion, the people spoke against God, as well as complaining about Moses’ leadership. God sent fiery serpents – hanehashim haseraphim – which attacked the people and, as so often, Moses interceded with God on behalf of the discontented multitude in his care. The solution which God commanded and which Moses carried out, was to make a copper serpent – nehash nehoshet – on a pole and, for anyone who was bitten by a serpent, the antidote would be to look on this and live. As we read in the haftarah, King Hezekiah later destroyed the copper serpent, known as nehushtan, because it was being treated as an object of pagan worship. You might think that a snake on a stick is a random object of curative potency but no, it has form in Sumerian, Egyptian and Greek antiquity. Asclepius who, in Greek mythology, was associated with healing and medicine, held a rod entwined by a serpent while Hermes AKA Mercury had a similar staff called a caduceus, with two serpents. The cult of Asclepius might conceivably post-date the Nehushtan, but the Sumerian deity Ningishzida, who held a rod with a snake entwined on it, appears in the second millennium BCE, which is well before the events in the book of Numbers. To this day the logo of a snake on an axial rod is used by the BMA and internationally, by many medical organizations. After the attack of the serpents and the remedy, the Israelites then continue their journey eastwards in the wilderness, reaching the Arnon, which is the border between the Moabites and the Amorites. We read a citation about the valleys of Arnon, from ‘The Book of the Battles of Lord’ which is one of the lost books mentioned in the Bible. This is in fact the only reference in the bible to the Book of the Wars of the Lord. Some scholars identify it with The book of Jasher, a book mentioned more than once but now lost, although there is a late midrash of that name. In the Greek translation of the book of Numbers, third century BCE, the words ‘War of the Lord’ are a fragment of a verse, rather than the title of a book and, in the Targum of Onqelos, the book referred to is just called ‘The Book of Wars.’ The bottom line is that we haven’t got it any more and can only speculate about what it was. Spring up, O well!—Sing to it! With the sceptre and with their staffs. This song raises the possibility of a gap in the narrative, a reference which has been lost. Who are the princes who dug the well? Midrashic and medieval commentators suggest Moses and Aaron dug the well at the beginning of the forty years in the wilderness, and that it accompanied the Israelites, providing water during their wanderings. Moses is not mentioned in the song.The provision of water, which the people sought repeatedly from Moses, was associated with the problematic waters of Meribah, where Moses angered God by striking the rock with his staff. There are two separate accounts of Moses striking the rock, found in both Exodus and Numbers. In the Book of Numbers, after the striking of the rock, God tells Moses and Aaron that, because of their insufficient trust, both of them would die before entering Canaan. Towards the end of the forty years in the wilderness, Moses has just a limited time as the living leader of the children of Israel. Aaron and Miriam are gone and Eleazar, Aaron’s son, is now the high priest. The time is near at hand when the Israelites must come of age, give up their interminable complaining and sing their own song. And finally, they are on the move, after being held up thirty-eight years in the wilderness of Kadesh Barnea. The next verse, after the song, tells of the continuing journey, on an easterly trajectory, towards the field of Moab by the top of Pisgah, the high location from which Balaam will look down at the Israelite camp. The period in the wilderness has been a cycle of battles, revolt, plague and hardship and has lasted so long that a new generation is emerging. Perhaps these younger people are the ones who sing, in the Song at the Well, of legendary princes – which may be a reference to Moses and Aaron or, as one midrash says, a reference to the Patriarchs. After forty years in the wilderness, still with no land of their own, the Israelites have at least a unifying historical narrative which they carry forward towards Canaan.